I have already introduced a few apps for iOS, Android and Symbian to find cell towers information like LAC and CellID, but none of them work on BlackBerry phone. After a few minutes search and research, I find that there is hardly any app has ever been created to achieve this objective and I finally give up. Since there’s no software can do this for us, we need to do it ourselves in test mode. In order to enter test mode, you need to unlock your BlackBerry mobile device first. The unlock code can be obtained online but you need to collect some data before you proceed. In this post I will guide you through the steps to find your CellID and LAC information and here we go. First step, go to ‘help me’ menu by pressing alt+shift+H (or alt+R A C E depending on your model), there you can find your App Version, PIN, Uptime and Duration etc. Write them down on a piece of paper for later use. Then point your cell phone browser to http://www.bber.info/escreen.htm, enter the data you write down after the page opens. 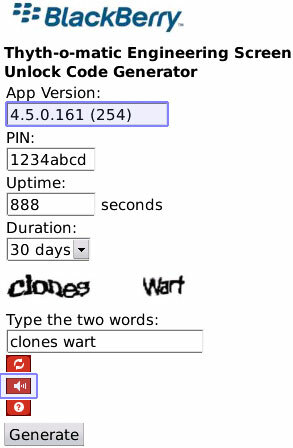 Please note there is a backspace before the parentheses in App version. For uptime, you can select from one day to 30 days. If you select 30 days, test mode will replace ‘help me’ screen in this period of time. When you finish entering all the data, click on generate and it will produce your unlock code, now enter these codes in ‘help me’ screen, always remember to hold alt key when you input! 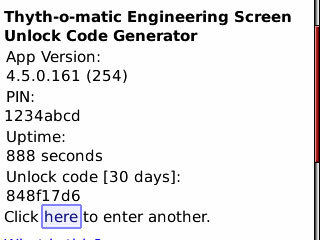 Second, once you enter the code, you will unlock your phone and enter the test mode. 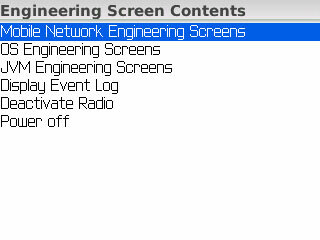 There are six tabs in test mode, and the first is Mobile Network Engineering Screens, that’s what we looking for. Test mode provides some useful functionality like deactivate radio, power off, battery charging, and killing processes and GPS information. Keep in mind do not change any settings until you know what you are doing! Third step, now click on Mobile Network Engineering Screens, and you will find a few tabs. Enter neighbor cells and you will find up to 6 neighboring cell towers. You will also find the CellID and LAC of the base station your handset connected to. Now you find the data you need! In addition to cell sites information, you can find your GPS information under OS Engineering Screens such as your latitude, longitude, altitude, direction and speed etc. If your BlackBerry phone could not establish a connection to GPS satellites after you reboot it, select Warm Reset GPS here and your handset could determine you location within 30 seconds. BlackBerry phone test mode is really powerful and offers you lots of practical functions, and there’s more for you to explore. However do not make any changes easily and you are responsible for any consequences of your action.